For the scripts, see Laṇḍā scripts. Lahnda (/ˈlɑːndə/) also known as Lahndi or Western Punjabi (/pʌndʒˈɑːbi/, is a group of north-western Indo-Aryan language varieties spoken in Pakistani Punjab and in parts of the neighbouring Azad Kashmir and Khyber Pakhtunkhwa. These terms are exonyms and are not used by the speakers themselves. The emerging languages of this dialect area are Saraiki, Hindko and Pothohari. The validity of Lahnda as a genetic grouping has not been established. Lahnda means "western" in Punjabi. It was coined by William St. Clair Tisdall (in the form Lahindā) probably around 1890 and later adopted by a number of linguists — notably George Abraham Grierson — for a dialect group that had no general local name. :883 This term has currency only among linguists. The southern varieties are locally called Saraiki, and northwestern varieties Hindko. The main identifier of Lahnda is use of 'saan, soon, si etc.' in the future tense instead of the Standard Punjabi "ga, gi, ge etc." Within Lahnda, Ethnologue also includes what it labels as "Western Punjabi" (ISO 639-3 code: pnb) – the Majhi dialects transitional between Lahnda and Eastern Punjabi; these are spoken by about 62 million people. Recently, Saraiki and Hindko are being cultivated as literary languages. The development of the standard written Saraiki began in the 1960s. The national census of Pakistan has counted Saraiki and Hindko speakers since 1981. Khetrani is commonly included, but may be a remnant of a Dardic language. Some of the northern dialects of what has for geographical reasons been considered Gujarati are actually closer to Lahnda. There is also a Lahnda language in Afghanistan and Ukraine in the form of Jakati. Lahnda has several traits that distinguish it from Punjabi, such as a future tense in -s-. Like Sindhi, Siraiki retains breathy-voiced consonants, has developed implosives, and lacks tone. Hindko, also called Panjistani or (ambiguously) Pahari, is more like Punjabi in this regard, though the equivalent of the low-rising tone of Punjabi is a high-falling tone in Peshawar Hindko. 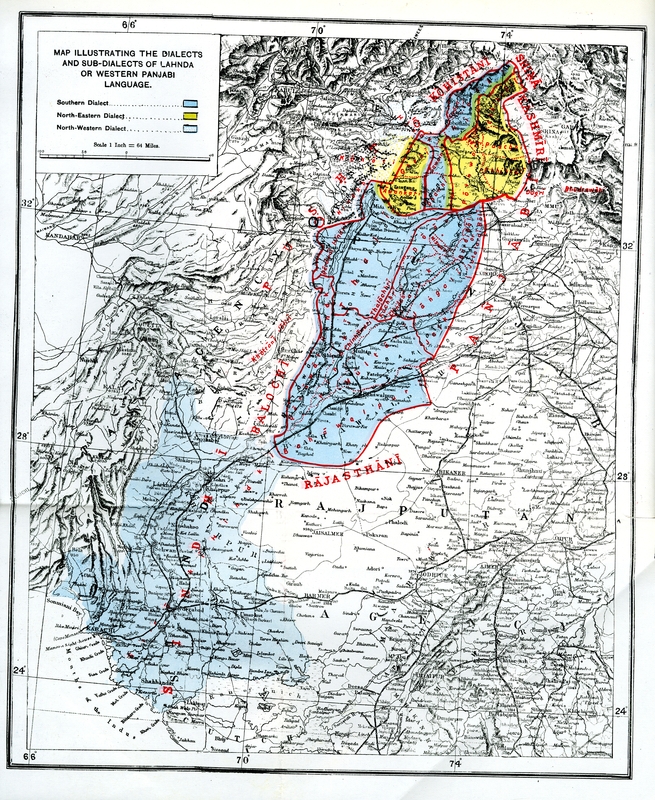 Sindhi, Lahnda, Punjabi, and Western Pahari form a dialect continuum with no clear-cut boundaries. Ethnologue classifies the western dialects of Punjabi as Lahnda, so that the Lahnda–Punjabi isogloss approximates the Pakistani–Indian border. ^ Hammarström, Harald; Forkel, Robert; Haspelmath, Martin, eds. (2017). "Lahnda". Glottolog 3.0. Jena, Germany: Max Planck Institute for the Science of Human History. ^ Defined as a "macrolanguage" in Simons & Fennig (2017) and as a "series of dialects" in Masica (1991, pp. 17–18). For the difficulties in assigning the labels "language" and "dialect", see Shackle (1979) for Punjabi and Masica (1991, pp. 23–27) for Indo-Aryan generally. ^ Masica 1991, p. 17–18. ^ Shackle 1979, p. 198. ^ a b Masica 1991, p. 18. ^ Grierson, George A. (1930). "Lahndā and Lahndī". Bulletin of the School of Oriental and African Studies. 5 (4): 883–887. doi:10.1017/S0041977X00090571. ^ Simons & Fennig 2017. ^ Lewis, Simons & Fennig 2016b. ^ a b Shackle, Christopher (2010). "Lahnda". In Brown, Keith; Ogilvie, Sarah (eds.). Concise Encyclopedia of Languages of the World. Oxford: Elsevier. p. 635. ISBN 9780080877754. ^ Rahman 1997, p. 838. ^ Javaid 2004, p. 46. ^ Masica 1991, pp. 18, 433. Lewis, M. Paul; Simons, Gary F.; Fennig, Charles D., eds. (2016b). "Western Punjabi". Ethnologue (19 ed.). (access limited). Simons, Gary F.; Fennig, Charles D., eds. (2017). "Lahnda". Ethnologue (20 ed.). (access limited). Rahman, Tariq (1997). "Language and Ethnicity in Pakistan". Asian Survey. 37 (9): 833–839. doi:10.2307/2645700. JSTOR 2645700. Shackle, Christopher (1977). "Siraiki: A Language Movement in Pakistan". Modern Asian Studies. 11 (3): 379–403. doi:10.1017/s0026749x00014190. ISSN 0026-749X. JSTOR 311504. Shackle, Christopher (1979). "Problems of classification in Pakistan Panjab". Transactions of the Philological Society. 77 (1): 191–210. doi:10.1111/j.1467-968X.1979.tb00857.x. ISSN 0079-1636. This page was last edited on 14 March 2019, at 03:52 (UTC).